Dental crowns are a common dental solution where an artificial cap is cemented onto a damaged tooth to preserve the shape and strength of one or more teeth. This is why the process is alternatively known as caps. There are many reasons your dentist may recommend a crown, and they are used for both restorative and cosmetic purposes. There are also a few different types of crowns that can be used depending on the situation. A crown is cap of artificial material that is used to cover one or more teeth.They are used in both situations, depending on the needs and wants of a patient—and often apply to both. Restorative dentistry is the term for dentistry that is used to heal damage or prevent problems such as cleaning, fillings or crowns. Restorative dentistry is the biggest use of crowns by far. Crowns are used when teeth have significant cavities or degradation and a normal filling would either be insufficient or impossible to apply. Particularly on larger teeth in the back, cavities can become so large that filling material will not be sufficient to save the structure of the tooth. In these cases, the cavities are cleaned and the tooth is prepped for a crown. This crown stabilizes the tooth and protects it from future degradation. They can also be used if a tooth is broken from external injury or trauma. Finally, if a patient has lost one or more teeth and needs a bridge, crowns are attached to the bridge to provide new artificial teeth. Cosmetic dentistry is the term for procedures that are used to improve one’s appearance and smile, such as whitening. Cosmetically, crowns are used if a person is not happy with the appearance of certain teeth, even if there is no medical issue with those teeth. They can be customized in many shades and look more like “celebrity” teeth. Crowns can last a lifetime, and are made of sturdy materials, such as gold or other metals. First, they are made to fit in your mouth and provide the same bite and appearance you had before. Typically, this metal is then covered by porcelain in a certain shade in order to match your teeth. As the technology of crowns has advanced, the process has also improved. Depending on the crown, they are made either with a casting machine on site, or in a lab. This will be left up to your dentist depending on the needs of that particular tooth. In the past, a mold was taken and then sent off to a lab for a crown. 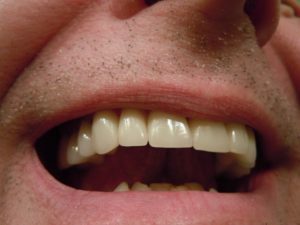 Your dentist would provide a temporary crown made of weaker materials, which would allow you to live normally until the permanent crown could be installed. While this is still necessary for complicated or major procedures, certain crowns can now be made in the office. Technology such as CEREC is able to create the permanent replacement within an hour or two, thus reducing the number of visits and the need for a temporary crown. Crowns will last a long time, but must be taken care of like regular teeth. Brushing and flossing must happen to keep the crown and your surrounding normal teeth healthy and clean. While it is possible for the cement to come loose, or a crown to need replacement, the process is getting easier and easier. Crowns are a vital dental procedure and help to provide a lasting smile. If you have a need for a crown or are looking to improve your smile and restore your confidence, call us and make an appointment today. Our dental professionals can help counsel you on the right way to fix any issues as well as give you the smile you’ve always wanted!